The Episode starts with King thinking about Abhi’s words. He asks Pragya why she is happy. Pragya says she talked to Kiara and she asked me to tell you I love you.. King looks at her surprised. Pragya says I wanted to give call to you, but she asked me to give you message that I love you Dada. King smiles. Abhi is looking at Pragya. Purab tells that even King is looking at Pragya. He asks him to dance with Pragya. Abhi says I wonder why King never fall in love with her. She is so good. Purab says it is good. He announces couple dance. Disha shows her mehendi. Purab smiles. Abhi holds Pragya’s hand and takes her to dance. They dance while the song Pal bhar…..Tanu gets upset. King gets doubtful. King comes to Pragya and takes her to dance with him. Pragya looks at Abhi. King imagines dancing with Pragya. Abhi gets upset and unplugs the music system. King asks who has stopped the music and even DJ escaped. Abhi says Pragya danced with me nicely. Dadi calls pragya. Abhi thinks she is not King’s wife and he is acting. King says Abhi has wife, but have an affair. They go to drink. They ask each other if they are hiding something. Abhi asks if he wants to ask him something. King says even you want to ask. Abhi says we will decide who will ask first. He tosses a coin. King wins the toss. Abhi says can you bear the truth. King asks him to say truth and asks do you like Pragya? Pragya hears him and gets tensed. Abhi smiles. Pragya comes to King and tells that Chachi is calling him and asking him to go and meet her. King says whenever we have a drink, you interrupt us. He goes. Abhi says you sent him as you don’t want King to know about us and I shall not know about you. Pragya scolds him taking King’s name. Abhi says I will drink more and if you don’t want me to drink much then tell me the thing which you are hiding from me. He asks her not to worry and says I will behave better than King. Purab comes to Disha and gets romantic. She warns him teasingly. Purab says you don’t have guts. Disha hugs him. Purab asks if we shall go to room. Disha says he is looking like King of romance and kisses on his cheeks. Purab says you have changed a lot. Disha says which one you want? Dasi calls Purab. He tells Disha that he will reply her later and goes. Pragya tells Disha that Abhi is drinking much. Disha says only you can handle him. Pragya asks why you are not listening to me. Tanu says you don’t have no right on him, he is my husband and asks why did you talk to Disha. She says he will listen to me, but who are you. Pragya asks her to stop him. 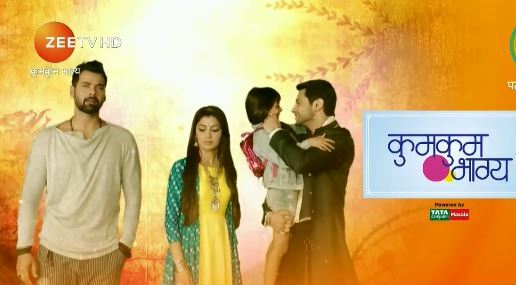 Nikhil comes to Dr. Anjali. Dr. Anjali says if I have an appointment with you. Nikhil says no and tells that he wants a straight answer from and threatens her politely. He asks which report is she making for Mehra family. Doctor recalls Disha’s words to keep it confidential and tells that she doesn’t know. She silently presses the security guard button. The security guards come there and holds him. Dr. Anjali takes his pic and says if you do anything then I will complain about you. Nikhil says sorry and leaves. Abhi drinks much. Tanu comes to him and says it is enough. Abhi asks with which right she is stopping him. Tanu says I am your wife. Abhi asks her to call Pragya.